You know those books that leave you a bit speechless after you turn the final page, and you struggle a bit to find words to explain the way they made you feel? This was one of those books for me. Wishtree is told from the perspective of Red, a northern red oak tree with 216 rings who lives near an elementary school. Red faces two houses–one blue and one green–and serves as a home for a variety of animals who don’t always get along, but they have enough respect for Red not to eat each other, and they are at least civil with one another. Red’s best friend is a crow named Bongo, and every spring, people from the neighborhood visit Red and leave their wishes written on scraps of fabric or ribbons (and sometimes socks or underwear) tied to the branches. When a new family moves into one of the houses and not everyone is welcoming, Red decides it’s time to do more than be still and listen. 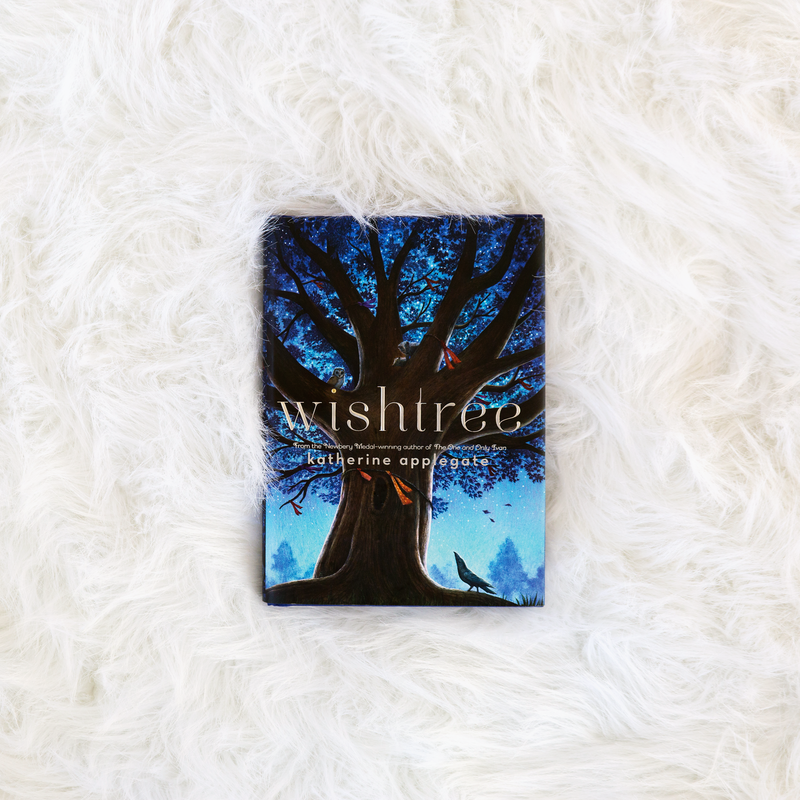 Wishtree is a beautiful story, and Katherine Applegate’s writing is profound. Through Red, Applegate teaches valuable lessons about strength, resilience, love, friendship, and acceptance. Adults who read Wishtree will easily identify the morals nestled inside the pages of Red’s story and recognize the messages about Islamaphobia and its similarity to stories of early immigrants who came to the United States from countries such as Ireland and Italy. The connection to the different species of animals living in the same tree and just trying to care for their babies and keep them safe will definitely not be lost either, and Applegate’s goal to teach those priceless lessons in a way that her target audience of a much younger crowd will understand is one that can hopefully be reached. Although Wishtree is a five star book for me, I have the same concern that I had with the other book I have read by Katherine Applegate, The One and Only Ivan. Both Red and Ivan are incredibly wise and articulate narrators, and I wonder if younger children will be able to comprehend their philosophical sides. Bongo, the crow, sometimes accuses Red of being too “Wise Old Tree,” in Wishtree, and that definitely happens at times. Although Red’s messages will remain with me for a long, long time, I can only hope that the children who read them will experience a comparable level of comprehension. For example, Red says, “I wanted to tell them that friendship doesn’t have to be hard. That sometimes we let the world make it hard.” Red also says, “But sometimes things happen that aren’t so good. When they occur, I’ve learned that there’s not much you can do except stand tall and reach deep.” Red’s message to “stand tall and reach deep” is one of my favorite themes throughout the book, and I sincerely hope that particular message is not too “Wise Old Tree” for this book’s target audience. I haven’t even touched on the incredible ending that caused me to have to put the book down for a moment to collect myself before I could read the last couple of chapters, the beautiful illustrations scattered throughout the book (the star pages were SO powerful), or the adorable baby animal characters. If you are reading this review because you are wondering if it’s appropriate for your child or because you are simply looking for an insightful book geared toward younger readers, just trust me when I say that you can’t go wrong with Wishtree. Posted in Children's FictionTagged book review, Fiction, fiction review, katherine applegate, middle grades book review, middle grades fiction, WishtreeBookmark the permalink.